The last thing Katie Couric needs right now is a reminder of her lightweight status as a fledgling newsanchor. About to launch her new career on Tuesday, the former Today Show co-host was recently blindsided by a surprisingly stupid CBS publicity gaffe. According to Broadcasting & Cable Magazine (originally reported by Web site TVnewser.com), CBS doctored photos of Katie in a recent edition of its self-published magazine called "Watch." In the photos, Katie’s neck and waistline are noticeably thinner than the real McCoys. CBS spokesmen admitted to the falsification, but offered no explanation for their actions. Did they think a slimmer Couric would project more gravitas? Would a sleeker Katie make CBS News viewers think they were watching a mean, lean journalism machine? If that’s the case, why not dump Katie in favor of Calista Flockhart? Poor Katie. So many people think she’s simply not up to the duties of being a serious journalist. And, aside from a much-heralded listening tour of the "heartland" in which she excluded journalists from attending, she hasn’t done much to help her cause. First, Couric said she wouldn’t travel to Iraq to cover the war because she owed it to her kids to stay safe. Now, there’s her dramatic "weight loss." One wonders if Edward M. Murrow, Walter Cronkite or even the nutty Dan Rather would have refused to cover a war from the front lines or appeared in doctored photos. To her credit, Ms. Couric apparently knew nothing about the pics, and issued a statement saying she prefers undoctored photos of her "….because there’s more of me to love." That’s cool. But, how does Katie create the gravitas needed to connect with serious newswatchers? Many argue that, in today’s entertainment and ratings-driven society, Ms. Couric doesn’t need to project anything more than the bright, bubbly lightweight personna of her Today Show days. I disagree. I think Americans will tune Katie out after the initial ratings spike subsides. In these brutally dangerous and uncertain times, I think Americans wil turn to someone who imparts caring, concern and credibility. Perkiness is great when one is covering the latest child-rearing techniques, Fall fashions or dating tips. But, it simply won’t translate to the death, despair and destruction that seems to greet us each new day in each new newscast. Imagine you’ve just been laid off. Now imagine your erstwhile employer, in its infinite wisdom, has included a list of 101 tips to save money alongside the pink slip. 1. "rent out a room or garage"
2. "shop in thrift stores"
4. "don’t be shy about pulling something you like out of the trash"
Talk about setting realistic expectations! Could you imagine receiving a list of "helpful" tips like this? It would make me feel like I was one step away from becoming a street person. I never cease to be amazed how badly organizations and their human resources executives muck-up their downsizings. Did this particular corporation really think its ex-employees would appreciate being told to shop in thrift stores, bicycle to work and pick their way through garbage? Handling a downsizing should be a carefully considered, closely managed communications exercise. In fact, the best organizations ordinarily go to great pains to express caring and concern to downsized employees, their families, the local communities affected by the firings, customers, and every other constituent audience (except, perhaps, the Street, which usually cheers any example of cold-hearted, numbers-focused actions on the part of a public company’s management). It shouldn’t surprise anyone to learn that the offending organization in this case was Northwest Airlines, which routinely ranks among the worst airlines (hence the nickname, "Northworst") and is legendary for its horrific customer service (so, why should they be expected to treat employees any differently?). So, here’s hoping that downsized Northworst airlines employees rummage through their neighborhood trash cans, pick out the nastiest objects they can find and forward said contents to the airline’s chief executive officer. Maybe that will get his attention. Or, maybe fearing his own imminent downsizing by the board, Northworst’s CEO may find a few things he likes in the incoming trash and hang onto them for the future. Yesterday’s New York Times article (subscription required) by Charlie LeDuff focused on the image challenges faced by the Catholic Church in recruiting ‘next generation’ nuns. According to the article, there were 180,000 nuns in the United States in 1966 (when, btw, a young Repman was doing battle with a particularly nasty order of nuns as a student at St. Francis Grammar School). Today, there are approximately 70,000 nuns in the U.S. But, and here’s the kicker: fewer than 6,000 are younger than 50. Talk about a classic marketing challenge. Just like Cadillac and Buick, which are dealing with an aging population that is slowly dying out, the Catholic Church finds itself struggling to make the sisterhood attractive and relevant to young women. According to LoDuff, multiple socioeconomic factors have precipitated the decline in nuns. First, there was the women’s movement. Then, there was the decision of the Second Vatican Council, which ruled that religious women were no more holy than lay women. So, in one bold stroke, the Church took away the motivation for young women around the world to enlist. Having had first-hand experience with an order of nuns known as the Sisters of Charity, I have to admit to not shedding many tears over the Church’s plight. The sisters, who were anything but charitable, were a holy terror. They meted out serious corporal punishment, inflicted all sorts of mental anguish and seemed to take great delight in making kids cry. They’d do all this while citing passages from the Bible and Baltimore Catechism #2, and lecturing us on the need to live a Christian life. The nuns were a major reason why I turned away from the Church and still have issues with organized religion to this day. My issues notwithstanding, can the Church turn things around and somehow make the sisterhood appeal to young girls? I doubt it. The Church is too much of an old boys’ network that has done little, if anything, to change the way it thinks or acts across the board. And, unless the powers that be re-classify the role and importance of nuns, why would a young woman want to dedicate her life to such a vocation? 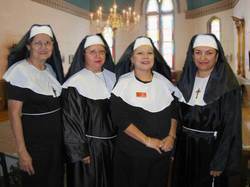 There are so many other, competing organizations that provide more visibility, rewards and satisfaction for young women, that I can see the day when nuns in the U.S. disappear completely. No matter what business you’re in, and the Catholic Church is a business, you must constantly reinvent yourself and be relevant…or be gone. But, who knows? Maybe the Vatican has a master marketer lurking in the wings who can turn things around and, like what Led Zeppelin, Hip Hop and Tony Soprano did for Cadillac, breathe new life into an old brand. Now, that would truly be a miracle. After much delay and consideration I went out and leased a new car yesterday. I say "delay" and "consideration" because I really was undecided which way to go. Over the years, I’ve leased a Jaguar, a Mercedes, an Acura Legend, and a Miata, among others. In each instance, the car seemed to perfectly define a different stage in my life. The little, red Miata, for example, was probably the coolest car I’ve driven, and fit my early, midlife crisis to a "T." That said, it was also totally impractical in so many ways: it was a true nightmare on icy roads, looked more like a motorcycle than a car and made my heart skip a beat whenever I considered the odds of surviving any accident. The Mercedes was my first "arrival" car. I say "arrival" because, in my mind, owning a Mercedes tells the world you’ve arrived. It makes a statement that says, "hey world, look at me. I’m doing pretty well." And, when I leased the Mercedes, I thought I had, in fact, arrived (now, a little older and, hopefully, a little wiser, I see "arrival" not as a destination but, instead, as an opportunity to hopefully give a little bit back). Anyway, the Mercedes turned out to be a total lemon, with one malfunction after another. I can still remember driving to the train station in the middle of winter with all four power windows stuck in the open position. So, where was Dr. Z when I needed him? So, my three years with the Jag came and went, and I turned the car in about two months ago. Since then, I’ve been in quandary. What do I do? Should I go with another Jag since I’d had such a positive experience? What about Lexus? We lease a Lexus SUV and love it for family needs. How about giving Mercedes another shot? What about Audi or BMW? Then, it hit me. I wasn’t even thinking of GM, Ford or Chrysler. And, in fact, I never do. Despite years of marketing and billions of advertising dollars, "Detroit" has never put a "dent" in my thinking. In my mind, I equate American cars with everything I am not. I know that sounds terrible, and I hope Republicans don’t see those words as either unpatriotic or anti-war, but that’s just how I feel. A man’s car projects his image. So, while some guys opt for the sleekest, fastest and hottest European sports cars, and others look to display their machismo with gas-guzzling Hummers, I want a slightly more understated machine. And, I’m open to Asian or European models. But, I would never, ever dream of going Detroit (and I simply can’t see that changing any time soon). So, I put my money down on a silver BMW M3 convertible with red interior (I know, I know. I said I wouldn’t get a sports car. But I was weak). It’s probably more car than I need but, in the end, I’m really excited about it and am really looking forward to the next 36 months with my ultimate driving machine. So, Detroit, how do we reconnect in late 2009? I really would like to factor you guys in my thinking the next time around. But until you can convince me that one of your cars will accurately reflect my image and reputation, I’m afraid I’ll continue playing hard to get. Pluto City, Pluto, August 24, 2006 — The entire planet of Pluto is in an uproar today after reports that Earth, the third planet in our solar system, downgraded our world to "dwarf planet" status. According to published reports, widespread rioting has broken out in such Plutonian cities as Number 9, Last-in-Line Junction and Cold as Hellville. 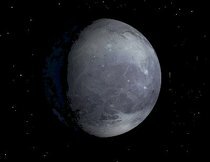 Plutonian President W9, who is expected to address the entire planet tonight at 8pm PDT (that’s Plutonian Daylight Time), issued the following statement, "While we are appalled by the decision of Earth’s astronomers to remove Pluto from the so-called ‘official’ solar system, we are not surprised. The third planet, and its occupants, are easily the most self-centered, egomaniacal race in the history of the universe. We not only reject their assertion that Pluto should be downgraded to dwarf planet status, we also hereby withdraw from the existing solar system and are announcing the formation of the new XPL solar system, which will be exclusive to smaller planets. We welcome asteroids, meteors and comets of all sizes, races and genders to join our inclusive system." Back on Earth, published reports indicate that people everywhere are uniting in support of Pluto and are calling on the planet’s astronomers to change their ruling. "Little planets are just as important and just as real as the big ones, " said Marvin Martian, the red planet’s ambassador to Pluto. "Our hearts go out to Plutonians in their hour of turmoil and grief caused by the imperialist hegemony of the Earthen entity." Meanwhile, here in Pluto City, government officials are already busy changing names of airports, highways and buildings. "Since Earth saw fit to take away our designation as the ninth planet, you’ll no longer find the number nine in our math system or in official government names," noted Pluto’s Homeland Security Secretary Q568X. "In fact, Number 9 City has just been renamed 8 1/2." Curiously, small cap stocks outperformed the rest of the market in an extremely active Plutonian trading day, and smaller market sports teams all won their respective sporting events last night. Pluto State University Sociology Professor V85t83 says such events may be more than mere coincidence. "It’s my belief that things happen for a reason. Maybe, at long last, the stars are finally aligned. Here’s hoping that Plutonians can get past their ‘size’ issues and, as the hub of a new system, finally be the big fish in a small pond. How would you deal with an employee who engages in gambling and has a very public extramarital affair with a 19-year-old woman? How about a different employee whose erratic behavior included lecturing people about the use of anti-depressant drugs and hopping onto a couch in the middle of an interview? The two management teams acted very differently. In the first instance, the management is the New York Mets and the employee is star catcher Paul LoDuca. In the last month, Lo Duca’s gambling habit became public news within days after a 19-year-old Long Island woman "outed" the All-Star catcher and their affair after discovering he had lied to her about being married. Mets manangement was strangely silent throughout the double crisis and has doggedly stood behind their man. Sumner Redstone and Paramount Studios have taken an entirely different tact with wacko superstar, Tom Cruise, ending their 14-year relationship yesterday. Obviously, these are two totally different scenarios. But, the fact remains that a management team’s treatment of an erratic employee clearly reflects on its image and reputation with all constituent audiences. Are the Mets sending a subliminal "boys will be boys" message by turning a blind eye to Lo Duca’s behavior? Are they saying that they’re willing to win at any cost, regardless of the message it sends to kids and their parents? Is Paramount, on the other hand, drawing a line in the sand, and telling its actors and fan base alike that Cruise’s various meltdowns reflect poorly on the film studio, and that it will enforce certain behavioral guidelines moving forward? I, for one, am heartened by Paramount’s moves and disheartened by the Mets’ inertia. Both send strong, distinct messages. And, both indicate the kind of society we’ve become. Sadly, though, Sumner Redstone’s resolve seems more of a quaint reminder of what American morals and ethics used to be, while Omar Minaya and the Mets seem to reflect where we are now and where we are headed. Thanks to Chris "Repman Jr." Cody for this idea. A 32-year-old relationship between Wal-Mart and Missouri advertising agency Berstein-Rein officially came to an end a few weeks ago (the account had been up for review since May). According to Ad Age (subscription required), the partnership that had begun with a handshake between Sam Walton and Steve Bernstein, ended with a phone call from Wal-Mart’s corporate communications department. The catalyst for the change was John Fleming, Wal-Mart’s new chief marketing officer. As is the case so often nowadays, the new guy wanted his own agency, and had no real regard for the legacy or heritage of what had gone before. So, now, Bernstein-Rein is left holding the bag, and will have to scramble to figure out ways to replace more than 30 percent of its total billings. Beyond the financial challenges, the KC shop also has a significant image problem to overcome since, according to industry observers, it’s always been seen as "Wal-Mart’s agency." Now that that "halo" is gone, the firm must quickly figure out how to re-position itself in a brutally tough competitive environment. To its credit, Bernstein-Rein is saying all the right things about its now being unencumbered and unfettered, and able to pursue new clients in a wide range of categories previously restricted by the Wal-Mart relationship. But, how long can it go without dramatic cutbacks and downsizing? And, will prospective clients see it as a smart, strategic solution or as just "Wal-Mart’s old agency?" Time will tell. Bernstein-Rein made a pact with the devil when it agreed to place so many eggs in one basket. While an 800-pound client can be a great thing to help build the image and reputation of a nascent firm, it can also inhibit growth, creativity and morale. 1) In our very early days, we represented Alexander & Alexander, a large business insurance firm that accounted for a sizable chunk of our billings. I’ll never forget the client call telling us they were about to be acquired by Aon. Happily, we found another large client, Ernst & Young, to fill the void. 2) E&Y was the client who first put us on the national PR scene. We began with a small project and, soon, they were accounting for 40 percent or more of our billings. As people came and went on the client side, however, our situation became more and more precarious, and finally ended. The simultaneous dotcom explosion, however, enabled us to replace the billings almost immediately. 3) Next came GE and the "imagination at work" campaign. Once again, a single client accounted for more than a third of our billings. And, once again, the client’s needs and wants changed, and we were out the door. 4) More recently, Tyco brought us on board, promising to not only be our biggest client, but to also provide billings in excess of $10 million annually (pretty heady stuff for an $8 million agency). The account started well and soon represented a third or more of our billings. But the CMO left, and so did the billings. Today, we have a much more balanced account structure and can more easily absorb the loss of a large client. But, I have to admit feeling a chill going up and down my spine as I read the Wal-Mart/Bernstein-Rein reports. Here’s hoping "Wal-Mart’s agency" can quickly re-position itself and attract significant billings. It would be a shame to see the actions of one man, the new Wal-Mart CMO, cause the demise of a long-standing Midwestern advertising tradition. The Cincinnati Bengals football team has instituted a novel way for fans to shut down those boisterous, bellowing and boorish fellow fans who just go too far at the game. Starting this season, fans will be able to dial (513) 381-JERK, and blow the whistle on anyone who’s fighting, making threats or is clearly drunk (the three are probably inseparable when one stops to think about it). Once the call has been initiated, stadium security guards will arrive on the scene, issue a warning and, in the more egregious cases, toss the offending fans out of the ballpark. How cool! 1.) Those jerks on the trains who carry on extensive cell phone conversations at a decibel level higher than the average jet engine. No one cares about what these jerks did or didn’t do over the past weekend. So, let’s dial the Cincy jerk police and get these dopes booted at the next station stop. 2.) The TSA security assholes who abuse their positions of power by making you suffer as they rifle through obviously mundane personal items. I’d also add the immigration and passport control bureaucrats on this list. Cincy jerk police: bust these guys, ok? 3.) The cocktail party guest who never stops telling you about himself, his job, his family and his lifetime accomplishments. "Hello, Cincy jerk police? Do you guys handle parties in Lincroft, NJ? You do? Great. Have I got a jerk for you." 4.) The power-playing prospective client. We’ve all run into these jerks. These are the people who know they hold all the cards in terms of the client-agency relationship, and will take advantage of it. They make cell phone calls in the middle of new business pitches, disrupt the presentation by whispering or giggling amongst themselves, or fire off negative or irrelevant questions dripping with sarcasm just to cause embarrassment (I still remember a dotcom-era new business pitch in which a prospect asked me why Peppercom’s work culture was so bad that it made our people physically ill. This was asked in light of a former employee who, suffering from morning sickness, had been misquoted in an article as saying she threw-up every day before coming to her job at Peppercom). How I would have loved to have been able to dial the Cincy jerk police during that session. If other examples warranting the jerk police come to mind, please share them. I really like the concept of the Cincy jerk police and think we should have more resources like this to call upon. You could almost refer to them as the "image" police. If someone begins acting in a way that will detract from his or her image, or the image of the organization he or she represents then, in my opinion, we should have the option to start dialing. Hat tip to Greg Schmalz for this idea. 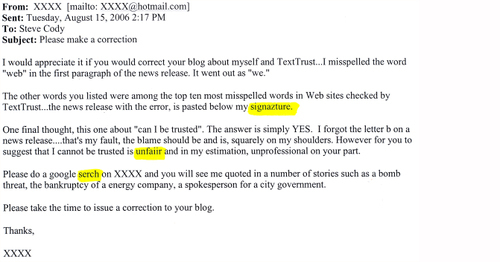 Two weeks ago I blogged about TextTrust, the Canadian company that sells spell-checking software, and the embarrassment they recently experienced after issuing a press release containing typos. Several days ago I received an email from TextTrust’s PR representative, informing me that my post contained inaccurate information. In my original post, I listed several words that I thought were misspelled in the TextTrust release. As it turns out, those words were simply TextTrust’s examples of the most common typos. There was actually only one real typo in the release. So, my bad for not paying close enough attention to my original source. I have since corrected my first post to reflect this. A quick visit to TextTrust’s Web site reveals marketing copy like "No more embarrassing errors!" and "No Second Chance to Make a First Impression!" I have no doubt that the TextTrust PR guy is a very capable professional. However, his note to me reinforces the point of my original blog: poor writing and sloppy grammar are becoming the PR norm, not the exception. Ted and I have a discussion with Matthew Schwartz, a reporter with BtoB and BtoB’s Media Business, about the image and reputation of the journalism and PR professions as they are portrayed in Hollywood. Woody Allen’s new movie, “Scoop;” Bravo’s reality series, “Tabloid Wars;” and Lizzie Grubman’s “PoweR Girls” all portray professionals in these fields as “drunks and tarts,” according to a recent article by David Carr in the NYT (subscription required). Why is it happening and how are these inaccurate and superficial portrayals affecting the fields of journalism and PR?